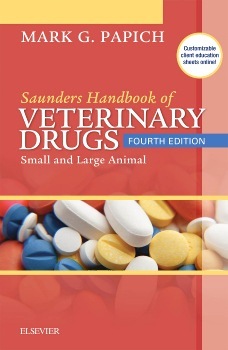 ・15 NEW drug monographs familiarize you with the latest drugs available for veterinary practice. ・NEW! Access to drug content is available on any mobile device. ・UPDATED drug monographs include information such as new doses, interactions, indications, adverse reactions, and contraindications. ・NEW! Discontinued Drugs appendix makes it easy to reference drugs that are no longer in use, and provides suggested substitutions or alternative drugs. ・Clinically relevant appendices help you determine appropriate therapeutic regimens and look up safety and legal considerations. ・PapichDrugFormulary.com companion website includes more than 150 customizable client information handouts for commonly prescribed drugs, including information on the prescribed drug and dosage, do's and don'ts, and possible side effects.